Summer is finally beginning to cast it's glow across what has been an unfathomably long and cold winter. Buoyed up by sunny vibes and a road trip to California, I've penned a piece for my fav women's all-time rock n' roll surf brand, Billabong Womens, hot off the back of the launch of their New Wave collection inspired by Billabong's long-time heritage in surf and the wild and rad bonds of a badass crew of friends. If you've seen me on the beach and in the waves you know I have a penchant for all the 80s high cut bathers, and I love this heritage blast collection and all the radical girl power vibes around it, the campaign featuring powerhouse surfer Laura Enever, Josie Prendergast, Alissia Quizon and golden girl Flick Palameeter. 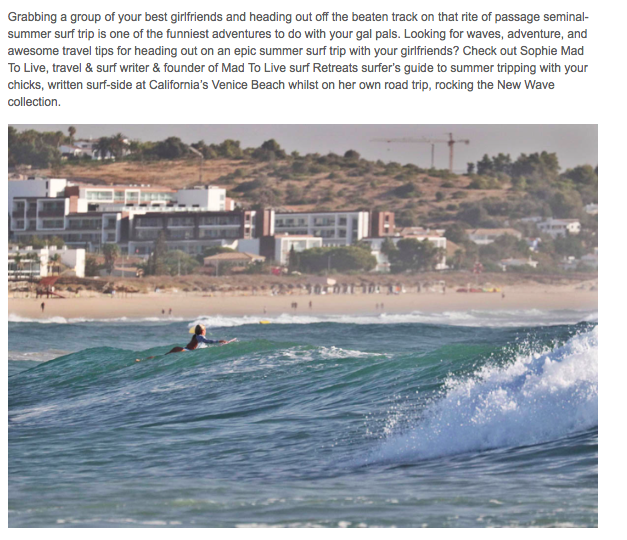 Check out my guide to awesome summer trips to do with your girlfriends over the summer!